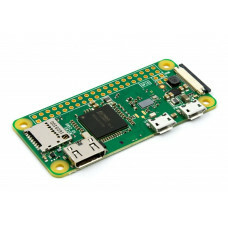 After Huge Success of Pi Zero V1.3, Raspberry Pi has launched a new Upgraded version Raspberry Pi Zero W (Wireless) Board with inbuilt Wifi and Bluetooth. Most important part about this board is cost effectiveness. We Recommend to buy our Super Saving Raspberry Pi Zero W Starter Kit which includes Raspberry Pi Zero W Board and all the accessories. Just like Pi3 , a CYW43438 Wireless chip has been added to get Wifi on Board. Zero W is the Smallest in Raspberry pi Family measures only 65mm long by 30mm wide and 5mm deep. It provides great connectivity with 2 Micro USB Ports(1 port for Power and other for USB Connectivity), 1 mini HDMI Port and 1 Micro SD Car Slot and has 512MB of RAM. It has same Processor as Pi 1 i.e Broadcom BCM2835 processor but clock speed is 1 GHz which is 40% faster . Official Raspberry Pi Zero W Wireless Casing can support both Pi Zero W and Pi Zero V1.3 Boards.It p..
Raspberry Pi 4GB SD Card With Pre-Loaded New Out of Box Software (NOOBS) recommended.. Description:-Want to hook your Raspberry Pi Zero W up to your HDMI Monitor? You'll need this Mini-HD.. Description:-Raspberry Pi Zero W Power Supply - 5V 2Amp (Micro USB)Features:CE and ROHS CompliantFor.. Description:-Raspberry Pi Zero W Starter Kit contains Raspberry Pi Zero W Board and all the accessor..
Class 10 - HIGH SPEED - 16GB Micro SD Card for Raspberry Pi 3B / 3B+Micros SD Card loaded with NOOBS..